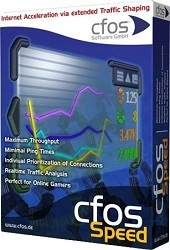 cFosSpeed, faster Internet with Traffic Shaping. cFosSpeed - Internet Acceleration with Traffic Shaping. Maximum Download & Minimum Ping. For DSL, Cable, Modem, ISDN, Mobile, Filesharing (P2P), Online Games, VoIP, Streaming Media and Tuning More.